Roads connect people to job opportunities and travel destinations. They support commerce, communication, public safety, and many other industries. Government officials around the world are looking for better ways to plan, build, operate, and maintain the transportation infrastructure that citizens rely on every day. In Germany, the Bavarian State Building Administration needed a stronger system to optimize its road infrastructure. So it chose to use Insights for ArcGIS as a data visualization tool, since the app is quick to implement and easy to use and makes sharing analysis simple. Insights for ArcGIS provides a comprehensive view of key performance indicators that are used to highlight regional disparities in road infrastructure and measure progress over time. The Bavarian State Building Administration—part of the Bavarian Ministry of the Interior, for Building and Transport, which oversees issues that range from public administration, police, and internal security to public buildings, highways, roads, and bridges—needed a strategic management tool for roads that would enable data analysis, support decision-making, and drive accountability. The solution needed to serve the Bavarian State Building Administration well into the future, so the ideal software had to meet four essential criteria. First, it had to provide a comprehensive view of key performance indicators that measure a variety of spatial, demographic, economic, and governmental policy outcomes. This would be used to highlight regional disparities and measure progress over time. Second, the tool had to facilitate easy collaboration among federal and state government officials. They would need a flexible, task-based workflow that would allow them to connect to available data, perform analyses, and publish their results—all while factoring in guidelines for government action. Third, the tool had to be a web-based solution. Users would need to be able to publish and share analytic discoveries online to support quick and accurate decision-making. Fourth, the ideal solution had to work with the Bavarian State Building Administration's existing information platform, BAYSIS, which is hosted on Microsoft SQL Server. BAYSIS contains an expansive amount of data on Germany's transregional road network and all road-related technical information, and it supplies this data to users both inside and outside the administration. The core Microsoft SQL Server database is augmented by a number of additional databases and apps as well, and all these information tools are brought together under one system: the digital version of Bavaria's road network. Insights for ArcGIS allows users to apply statistical methods to analyze relationships, such as the correlation between the frequency of accidents and the distance people drive from their residences to their workplaces. To find a solution that met these criteria, the Bavarian State Building Administration conducted an in-depth market study of potential vendors. The organization assessed both single-user and web-based solutions, as well as various product offerings from Esri. After much research and evaluation against the key criteria, the administration decided that Insights for ArcGIS best met its needs. 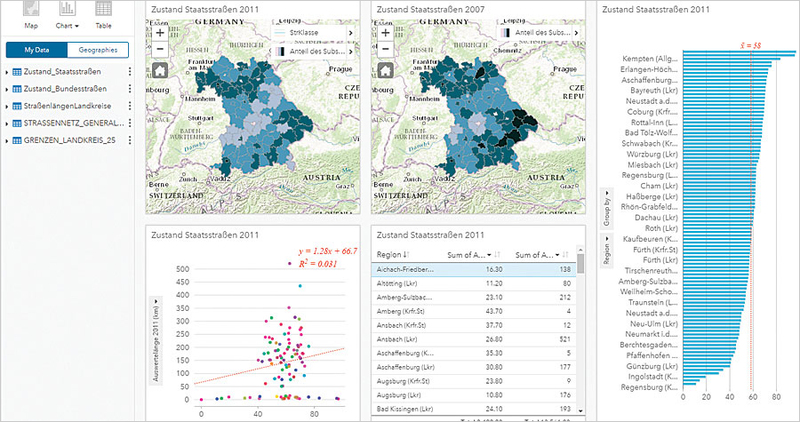 "Insights for ArcGIS supports the process for both management and government decision-making in a way that optimally serves both a citizen- and business-oriented infrastructure deployment," said Roland Degelmann, head of unit infrastructure planning for the Supreme Building Authority in the Bavarian Ministry of the Interior, for Building and Transport. In selecting Insights, Degelmann said the team liked how the app allows users to connect to many data sources (such as Microsoft Excel spreadsheets), geodatabases, enterprise databases (such as SQL and SAP HANA), demographic data from Esri, and publicly accessible statistical material. The modern user interface and drag-and-drop functionality enable Bavaria's transportation authorities to perform spatial analysis in just a few clicks. The team can then share analysis results or the analysis model with others. Once it was decided to use Insights, the Bavarian State Building Administration deployed the app quickly. Although the people working on the project did not have special expertise in GIS, they found Insights easy to use and were able to get up and running fast. Soon, they could see and analyze data for decision-making and share their analyses and visualizations online. 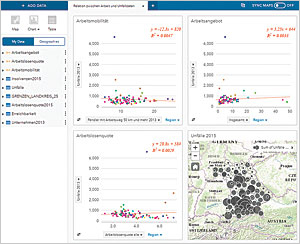 The Bavarian State Building Administration sees Insights as an analysis platform for the future—especially because of its ability to apply statistical methods and run analytic processes on the fly, or dynamically. The app is flexible enough for Degelmann to feel confident that he can use it to tackle yet unknown challenges and issues. And because Insights is scalable, Degelmann plans to use it to calculate and analyze key performance indicators in a larger, statewide context. "In the future, Insights for ArcGIS will be an essential basis of the management process of the Bavarian Authority of Road Infrastructure," Degelmann said. "The consistent application of such tools will result in significant time and cost savings and efficiency gains."